Selection of available hotels in and around Manilva. Book online now. I REALLY WANT TO SELL MY PLACE IN SPAIN Hi RU Looking for a Holiday Home or to Retire to Sunny Sun? https://www.facebook.com/groups/357730101099287/ Then this site has private owners property for sale listed on it, plus property from local Spanish Estate Agents You are invited to have a look at and join. This is where private owners and local agents post what is available. It is of course Free to join. Plus new interesting posts go up most days. Your chance to be in the know. If you require extra info leave details on joining application form. Mindfulness is all about focusing on the present moment, using techniques such as yoga, breathing and guidance whilst walking. By focusing on the here and now, it is easier to forget past regrets and thoughts about worries in the future. Our yoga and meditation holiday is specially designed to suit your personal needs and current situation to help you on your way to leading a healthier and less stressed lifestyle. There will be plenty of time to spend relaxing on the beach or boutique shopping in Moraira a stroll from the villa. Offering a spa and an outdoor swimming pool, Apartamentos Pueblo El Goleto are set less than 1 km from Manliva’s Sabinillas Beach. It features bright, spacious accommodation with hydromassage baths. The air-conditioned apartments have a comfortable living room with satellite TV. They also have a kitchenette with an oven and washing machine. Mediterranean cuisine is on offer in the Rincón del Goleto restaurant, which overlooks the pool and attractive gardens. The spa has Turkish baths, a sauna and jacuzzi. There are also sports facilities, including a gym and mini-golf course. 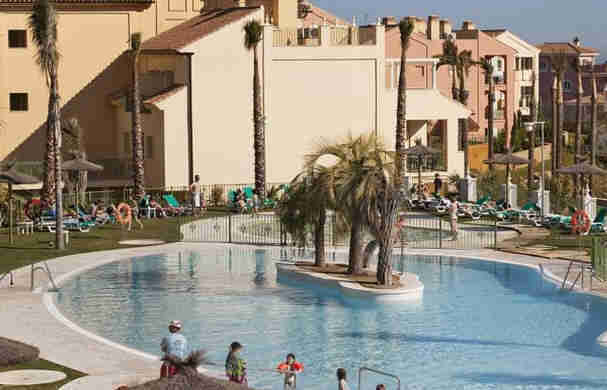 Apartamentos Pueblo El Goleto are set between Estepona and Sotogrande. The complex is set on a hill above the Costa del Sol, offering Mediterranean Sea views and overlooking the surrounding countryside. Bright, air-conditioned apartments feature satellite TV and a balcony with views. There is a sofa bed in the living room, and you can hire the safe. Each apartment has a dining area and a well-equipped kitchenette. There is a fridge, microwave and coffee maker. Apartamentos Manilva Green have an on-site pizzeria restaurant, barbecue facilities and a lounge bar. There is also a mini-market and vending machines for drinks and snacks. Free on-site parking and a free Wi-Fi zone are offered. You can hire a car from the 24-hour reception and tour desk. La Duquesa Golf and Country Club is a 5-minute drive away. Bali has so much to offer travelers from family to romantic getaways. We can help you find the best accommodation on the island. Bali villas and More is an Australian owned company and experts in Bali travel. We have a portfolio of bali villas around the island, whether you want to be in the heart of the action or getting away from it all. We offer monthly payments to make your Bali holiday more affordable. Contact us today to get the latest deals! This luxury, beachfront hotel is located just outside Estepona, on the Costa del Sol. It offers a spa, indoor and outdoor pools and elegant rooms with a private balcony. The air-conditioned rooms at Gran Hotel Elba Estepona & Thalaso Spa GL feature stylish décor. Each one has satellite TV and a private bathroom with hairdryer. The Elba complex has 5 seasonal restaurants, including a typical Spanish restaurant and an Asian restaurant. A daily buffet breakfast is served on the terrace, and there is also a piano bar and cocktail lounge. Available for an extra cost, the Elba Estepona’s spa features a hot tub, sauna and steam room. There is also a gym, as well as a golf desk where you can book green fees. Easily accessible from the AP7 Motorway, the hotel is 20 minutes’ drive from Marbella. Hotel Rooms: 204, Hotel Chain: Hoteles Elba. Each spacious room at Guadalmina Spa & Golf includes a terrace with views of the sea, gardens or golf course. They also feature a flat-screen TV with satellite channels. Guests enjoy free access to the resort’s fitness room and outdoor pool. There are special rates at the spa and a range of treatments are available. The Taray Restaurant offers meals on the seaside terrace, while the Cocoa Restaurant serves a buffet breakfast and international cuisine. There is also a bar and a beach club in the summer. Hotel Guadalmina Spa & Golf Resort is only 6 km from Puerto Banus and 10 minutes’ drive from Marbella Old Town. Free parking is available on site. https://www.bookculinaryvacations.com/foodies-in-the-city/3-days-market-tour-and-paella-cooking-class-in-madrid-spain?aid=3773 Discover fresh ingredients and learn to cook authentic traditional Spanish dishes and find the most hidden culinary secrets of the Spanish culture. Join for a delectable cultural and gastronomic hands-on experience preparing Spanish dishes and drinks! Hu’u Villas are located in the heart of down town Seminyak in trendy Petitenget. In recent years, Petitenget has become one of the most desirable areas on the island. Around 40 minutes drive from the airport (traffic depending of course). Explore your holiday at hu’u Villas, contemporary style, inspired by urban loft style living meets the tropics, providing stylish holiday accommodation with every amenity at your finger tips. Hu'u Villas is the new icon of understated tropical modern luxury. Your hotel even cheaper booking on the official website. Located on Seminyak, Sea Vu Play is a great venue for Seminyak Bali nightlife. The central location means we’re easily accessible from wherever you may be staying. The crew of Sea Vu Play think life should be fun, and fun is worth celebrating. Sea Vu Play Bali is one of the best restaurants Seminyak, and then take your time exploring the drinks menu as you dance the night away. True to our philosophy of fun, at Sea Vu Play we keep the weekend going and in our magical world, Sunday is always fun day! AMO offers a complete menu of high quality spa experiences..Massages, Facials, Hair & Make Up, Waxing, Scrubs and more. The pilot venue located across from the W Hotel began 8 years ago simply by turning out perfect manicures and perdicures. Experience the best at AMO now at two locations and into its third location development it is renowned on the Island for quality and style and is well established as one of the leaders. Committed to helping you look your best whilst you’re on the island. The Patagonia Xpress travels from Benoa Harbour, Bali to Padangbai before heading to Gili Trawangan, Gili Air before returning to Benoa via Bangsal in Lombok and Pandangbai. Reaching the Gili Islands is safe thanks to the convenient services of Patagonia Xpress . Our experienced and certified captain and crew will endeavor to provide a positive experience in terms of customer satisfaction. Book online and travel in style and comfort on the Patagonia Xpress – the best Gili fast boat there is. Bali Villas and More has searched the island and hand selected only the best villas. We have villas in all of Bali’s popular holiday locations, to suit every budget. We’ll save you hours of time and make booking your villa a hassle free, check our best 4 bedroom villa seminyak are often cheaper per person per night than staying in a hotel when a family or a group. We have searched the entire Island to bring you the best villas, with the best price and service. When you’re booking with us you know your booking the best .